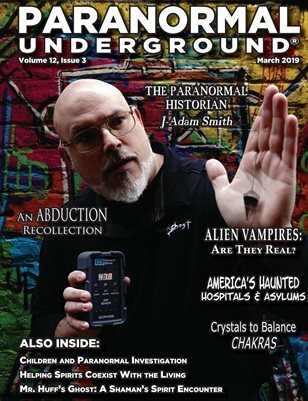 In this issue of “Paranormal Underground” magazine, we spotlight J-Adam Smith, “the paranormal historian”; the new “Pet Sematary” trailer; and the “psychic romance suspense” book “Wrynter” by Linda Mooney. In our Case Files of the Unknown, we feature America’s most haunted hospitals and asylums; the truth about alien vampires; and myths surrounding the Eagles’ “Hotel California” album and song. And, in our Special Report, we take a look at children and paranormal investigation. Also in this issue, we discuss how to understand chakra imbalances, as well as the crystals that help balance your chakras; how one empath deals with “the Rh factor”; and one shaman’s encounter with “Mr. Huff’s ghost” as a child. Plus, we examine if the human brain can create a 3D holograph of the hereafter; share an alien abduction and mind control; and profile how one paranormal investigator helped a spirit coexist with the living. For a 12-month PDF subscription, visit paranormalunderground dot net!